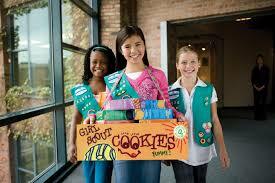 Buy Girl Scout cookies; tis the season. Girl Scouts are everywhere selling cookies—shopping malls, grocery stores, schools, churches and temples, you name it; Girl Scouts are in your neighborhood selling cookies. For more information go to girlscoutcookies.org. Type in your zip. Help them out and help yourself to delicious cookies. Why Girl’s favorite Girl Scout cookies are tagalongs and thin mints. For 100 years, Girl Scouts has used cookie earnings to build everyday leaders who make a positive impact on our world. It started in 1917 when Girl Scouts in Muskogee, Oklahoma, did what Girl Scouts everywhere always do. They had a great idea, got together, and took action to make it a reality. The girls of Mistletoe Troop hit upon the clever idea to fund their projects by selling cookies they made themselves in their kitchens at home. So simple—and so smart! Other troops took note, and the idea of Girl Scouts selling cookies took off—A Nationwide Movement was born. Why are GIRLS as young as 10-years-old shaving? According to GET HAIRY FEBRUARY MOVEMENT, in 1915 a large corporation ran an advertising campaign telling us that hair on a woman legs and underarms was ‘ugly’ and ’embarrassing’. Today, GIRLS as young 12 10 shave to avoid the ’embarrassment’ of their natural bodies. The#GetHairyFebruary initiative is raising funds to provide services and support for victims of domestic violence and sexual abuse.